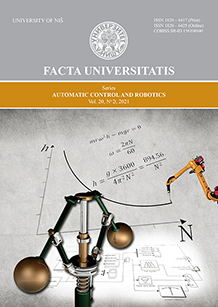 Aims and Scope: The principal aim of the journal is to bring together the latest research and development in various fields connected in any way with the Automatic Control and Robotics. We would like to higlight that papers should refer to Focus and Scope, but they are not limited to. Rapid publication: Online submission system, electronic peer review and production make the process of publishing your article very simple and efficient. Usually, it takes 2 to 3 months before the moment you finished your submission and a response generated by the reviewing system. If your paper is accepted, we will try to publish it in the current issue. If the authors provide a previously published conference submission, Editors will check the submission to determine whether there has been sufficient new material added to warrant publication in the Journal. The FU Aut Cont Rob guidelines are that the submission should contain a significant amount of new material, that is, material that has not been published elsewhere. New results are not required; however, the submission should contain expansions of key ideas, examples, elaborations, and so on, of the conference submission. The paper submitted to the journal should differ from the previously published material by at least 40 percent. Research articles are usually 10 to 20 pages long. However, in special cases, shorter or longer articles may be accepted with appropriate reasoning. Authors are requested to follow FU Aut Cont Rob guidelines for preparing their manuscripts. An article sample template can be found here.